The Trojan Horse will begin its last “rights” of passage Friday at sundown (Assembly at 6 PM). Columns of Burners will pull the 28-ton beast on its massive cart across the playa and through the Gates of Troy. After the horse has entered the gates, a short, intense daytime firework will erupt. At 10:30 PM the party starts, bands will play and people dance. Before long, a chant will begin and build: “Burn the Beast! 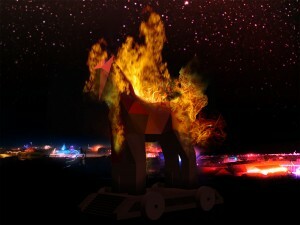 Burn the Beast!” Four whirling dancers will appear bearing torches and light each leg of the horse. Apollo and his band of archers will shoot flaming arrows onto the upper reaches of the beast. In a spectacular conflagration featuring additional pyrotechnics, the horse will burn quickly and, led by Pan, dancing will resume around the fallen beams and embers. A riotous night of revelry (some orchestrated) will follow.